5.1 Q: Do I really have to deadhead the flowers? 5.2 Q: The top two inches of my phlox has been chewed off! Help? 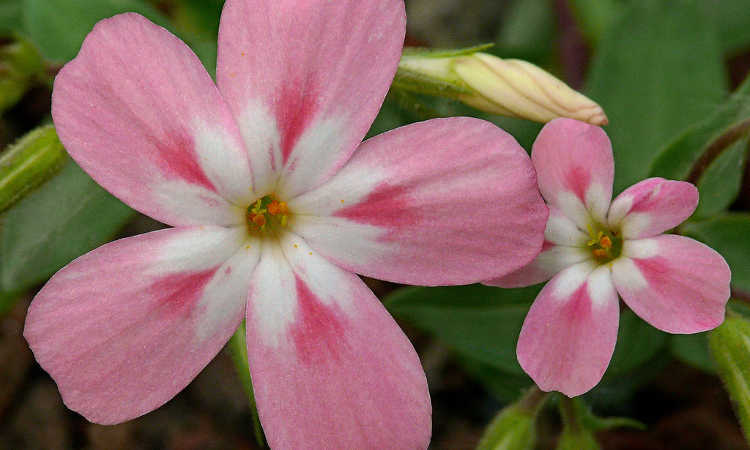 In shades of white, pink, red, purple and blue, phlox is an incredibly popular, brilliantly-flowered ornamental plant. Whether it’s creeping phlox spreading out to become a beautiful ground cover, or a mounding phlox plant in the garden, these delicate flowers are definitely a sight to behold. The term “phlox” originates with the Greek word for “flame”, likely referencing some of the red shades of this plant. However, most of the phloxes that grow wild throughout North America tend towards lighter hues. 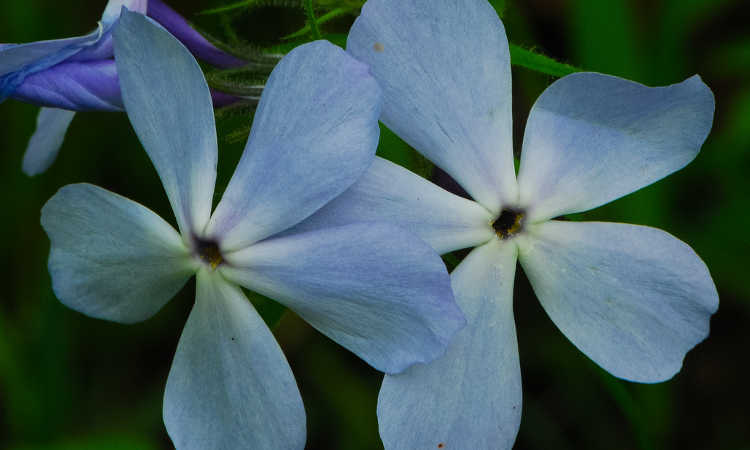 Let’s explore some of the diversity of phlox species today, as well as go over the best way to ensure you have a proliferation of bright blooms throughout the year! Fertilizer Compost, aged manure, or leaf moss is fine. Otherwise, balanced slow-release granular fertilizer in the spring. Propagation By cuttings for best result. Division and seed also viable. 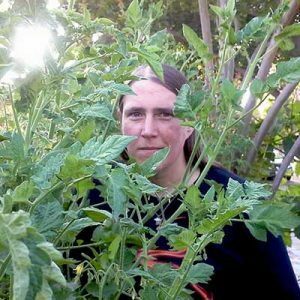 Pests Subject to damage from spider mites, aphids, and phlox plant bugs. 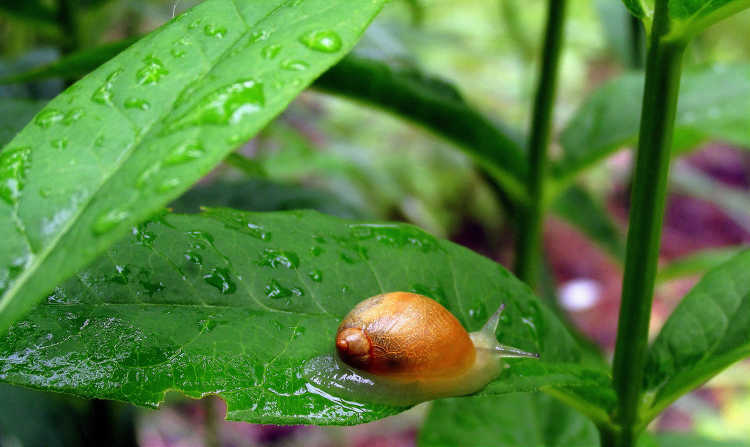 May house slugs or snails and receive minor damage from them. Also susceptible to powdery mildew, leaf spot, rust, and root/crown/stem rots. 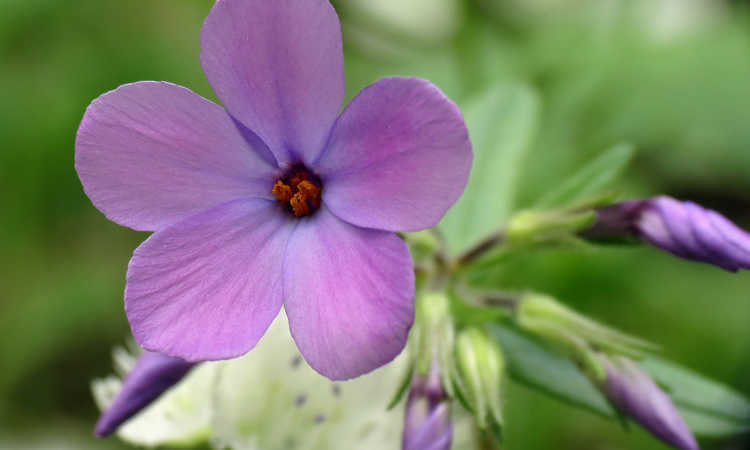 There are 67 species of plants in the Polemoniaceae family, all of which are considered to be phlox. While I can’t cover them all in one fell swoop, let’s go over a few of the more popular varieties. With petals that tend towards heart-shaped or which have tiny teeth at the edges, creeping phlox is a very popular perennial. 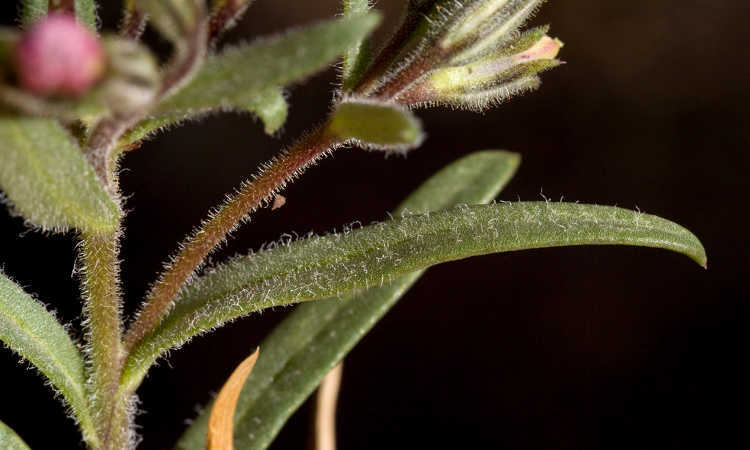 Native to the eastern and central portions of the United States, Phlox subulata has needle-like leaves on slender stems. In coloration, it can range from rose and mauve through lavenders, blues, and whites as well. One of the cultivars of this species, the rose-pink variety known as “McDaniel’s Cushion”, has won an Award of Garden Merit from the Royal Horticultural Society. 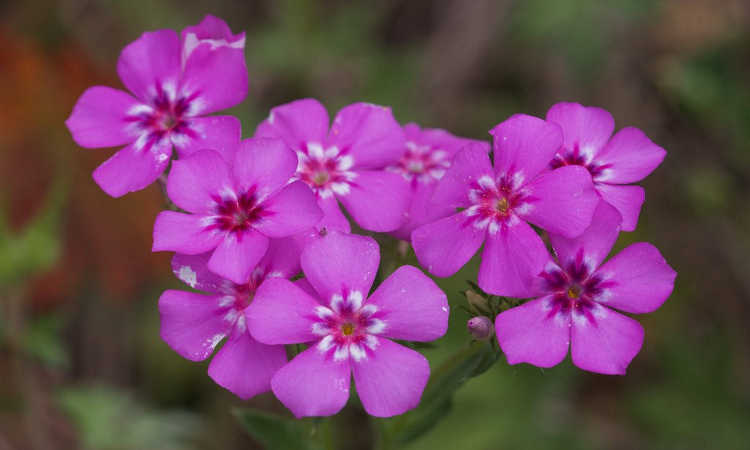 Clumps of flowers in tones of pink, red, purple or white are a sign of Phlox paniculata. Named after its pannicles (clustered blossoms), this plant is often grown as a small shrub, or trained to a bushing habit. It originates in the eastern and central United States, and can be found in eastern Canada as well. Twelve separate cultivars of Phlox paniculata have gained the Award of Garden Merit. It’s incredibly widely grown as an ornamental plant, and is popular worldwide. A native to Texas, Phlox drummondii is also widely spread across the southeastern United States. It is named after the Scottish botanist Thomas Drummond. This phlox ranges from creamy colors all the way through a purple so dark that it’s nearly black. This particular species is often seen planted along highways throughout the southeastern United States, but is widely found in gardens as well. A popular variation is the variegated “Twinkle Star” variety, which ranges from pale pink to hot pink in color. With a pair of cultivars that have also gained the Award of Garden Merit from the RHS (the “Bill Baker” and “Miss Lingard” cultivars specifically), Phlox carolina is a common sight in the eastern US. Originating in the Carolinas, from which it takes its name, this species tends towards purple, pink, or white blossoms. The common name “thickleaf phlox” is apt, given that this has a very wide leaf pattern in comparison to other phlox species. The greenery tends towards darker tones, making the flowers stand out brightly against the leaves and stems. 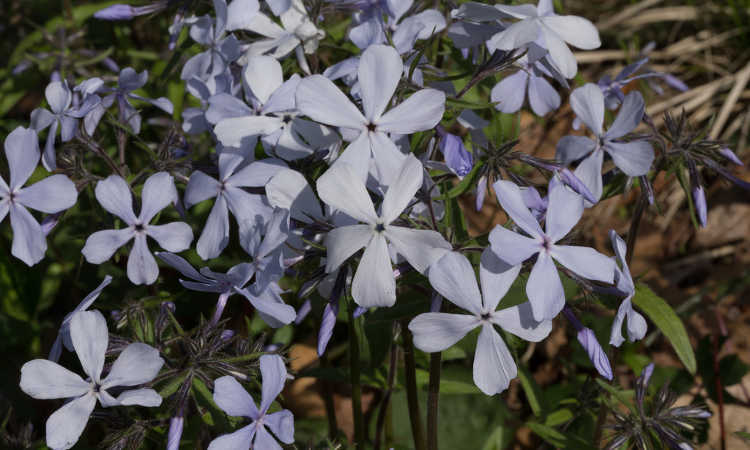 The woodland phlox, Phlox divaricata, can be found in forests and fields along the eastern portion of the United States. There are two subspecies of this species. Subspecies divaricata has notched ends to the petals, where subspecies laphamii does not. The “Chattahoochee” cultivar of Phlox divaricata spp. laphamii has won an Award of Garden Merit from the RHS for its lavender blossoms with brilliant purple-pink centers. Other popular cultivars include “Blue Moon”, “Fuller’s White”, and “Clouds of Perfume”. 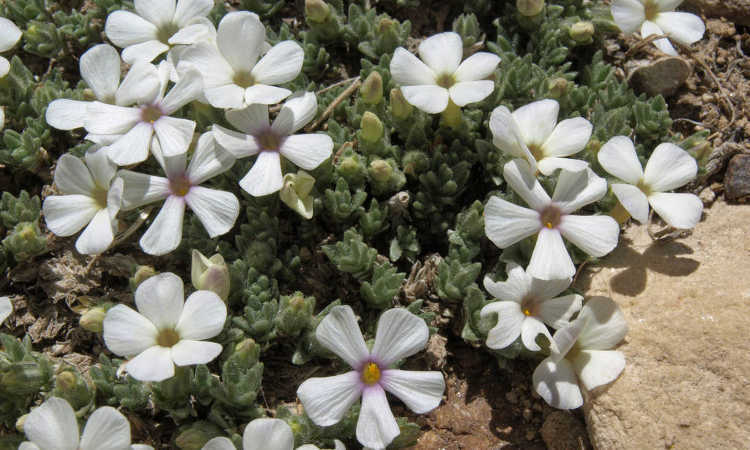 Phlox condensata calls the western United States home, especially the mountainous portions of eastern California, Colorado, and Nevada. As a ground cover this perennial dwarf phlox is nearly ideal, since it rarely grows to any significant height and has a tendency to form a creeping phlox mat along the ground’s surface. It seems to prefer rockier, well-draining soils. This perennial form of spreading or creeping phlox is distributed throughout the western United States and into British Columbia. Often, it forms patches of flowers across hills and mountain slopes. Slightly taller than the dwarf phlox, Phlox diffusa is more commonly found in the wild than in garden settings, although it can be easily transplanted to gardens as well. Not to be confused with Phlox subulata, Phlox stolonifera is indigenous to the Appalachian mountains and surrounding woodland areas. It can be found as far north as Quebec, Canada, but is primarily located in the United States. Phlox stolonifera gets its name from its stolons, or runners, that make it a creeping phlox variety. Pink, purple or white in petal color, this variety is most commonly found in the wild. Its oval leaves and 6-10″ height make for a particularly pretty cover plant. Phlox adsurgens. Source: J.G. in S.F. 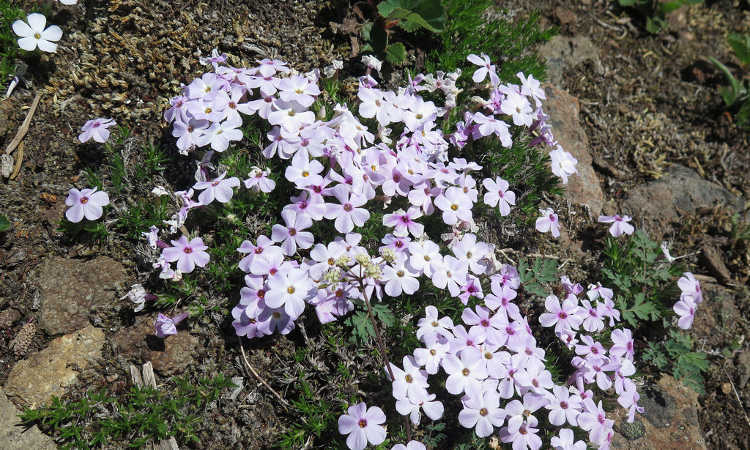 Native to Oregon and parts of the coastal California mountains, Phlox adsurgens tends towards five-petaled pink flowers with cream or white markings. Some petal shapes tend to point at the tips, making them look like tiny pink stars. Others remain rounded at the tip, like those seen above. These are most common in forested or woodland areas. While they are slowly gaining popularity as an ornamental variety for garden use due to the beauty of their coloration, they’re still most common in their natural environment. The phlox plant is surprisingly low-maintenance, but there are a few things you can do to guarantee the best results. Most of the creeping phlox varieties like full to partial sun. These include both the border species like Phlox carolina and most of the woodland species. 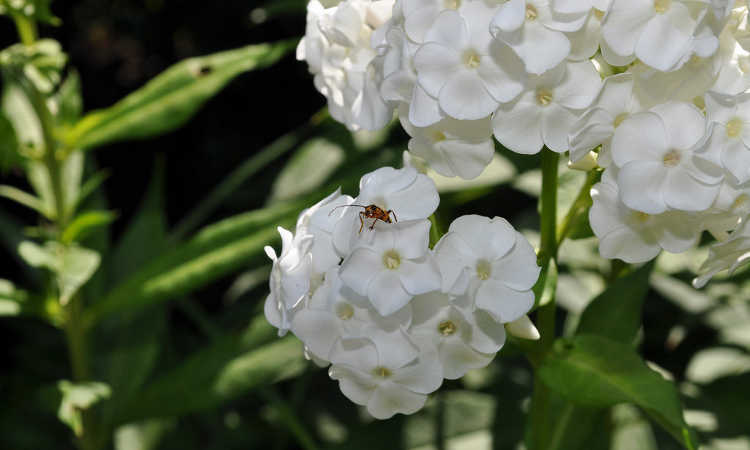 Any of the mounding varieties, such as Phlox paniculata, prefer full sun. As long as your phlox plant gets a minimum of six hours of light per day, you should have good growth potential. In general, most phlox prefers a minimum of 1″ of water per week. However, areas which get hot may require more water for the plants. It’s important to always water phlox, whether creeping phlox or the mounding varieties, down at the base of the plant. In fact, it’s easiest to simply use drip irrigation around phlox as it will reduce the risk of powdery mildew or other plant diseases. A good rule of thumb for the phlox plant is that if you can feel moisture in the soil when you stick your finger a couple inches beneath the soil’s surface, you should be alright. Adding mulch to retain soil moisture is advisable. Rich soils are optimal for phlox plants. The soil for your creeping phlox should be on the alkaline side of neutral (6.5-7.0), so if your soil is acidic, a bit of horticultural lime would be a good addition. Lots of organic matter in the soil is preferred, so be sure you amend your soil with aged manure or compost. Good drainage is required, as these plants don’t like to have wet feet. However, these plants do not do well in hot, dry soil, so be sure that the soil remains evenly moist. Two inches of mulch around the base of your plants will also help to keep the moisture level to the plants’ liking. If you add an inch or two of compost around your perennial phlox plants once per year, chances are that you won’t have to fertilize them. However, if you do fertilize them, be cautious. Too much nitrogen can cause these plants to produce lots of leaves and fat stem growth instead of the pretty white, purple, blue, pink and red phlox flowers that we want to see! Fertilizer choices for your phlox should be slow-release granular options, preferably ones which spread out release of nutrients over a 4-5 month period of time. Broadcasting a balanced granular option around your plants as they’re putting up new spring growth is perfect. Some of the taller varieties of phlox, such as Phlox paniculata, also appreciate a secondary side-dressing of a liquid fertilizer during the summer months to keep producing color during the hotter months. However, the best bet is to ensure your soil is rich and fertile before planting and add compost or leaf mold annually, and the plant will take it from there. It’s also important to be mindful of what else is around your plants. 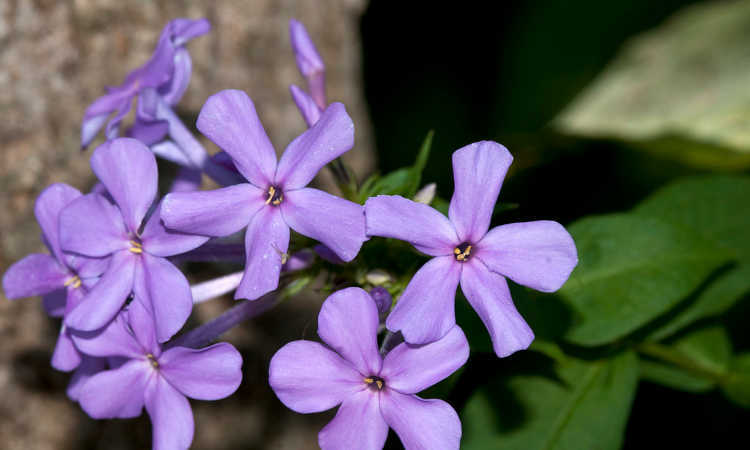 Planting creeping phlox underneath trees or large shrubs or bushes is a bad idea, as it puts your phlox in immediate competition for soil nutrients. 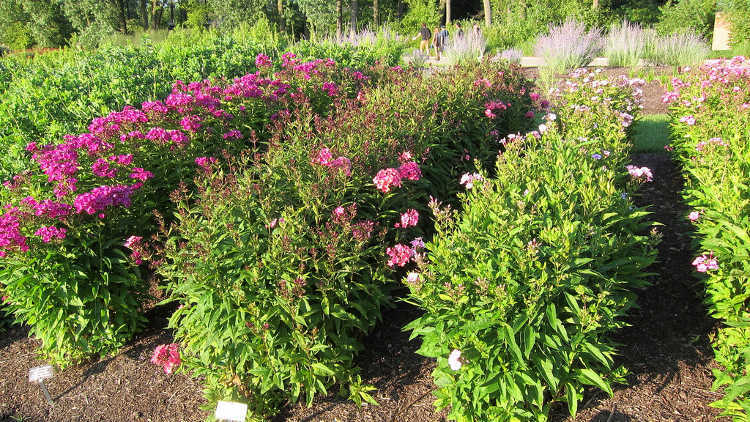 If you do decide to plant near larger plants or trees, you may need added fertilizer to keep your phlox healthy. While you can propagate most varieties from seed, phlox is easiest to propagate from cuttings. A six to eight inch cutting will take root extremely easily in water, potting mix, or perlite. If you have a particular cultivar that you’re trying to maintain, cuttings are definitely the best way to go, as seed will not always produce true copies of the parent plant. In fact, it’s important to deadhead the fading flowers before they can release seed, because phlox will readily self-seed and the resulting plants might not be what you expect! Some varieties, such as Phlox stolonifera, also will propagate from runners or stolons beneath the soil’s surface. These types can spread quite rapidly. Keep an eye on these beds and be ready to trim back runners that are trying to travel out of their planned space. You can also propagate phlox from division. Every few years, carefully remove your plants in the early spring and cut them into smaller chunks with a sharp, sterile knife or shears. Replant part of it, and then either expand your phlox bed or place the other segments into pots to give away to friends or family. This also gives you the ability to amend your soil at the same time, working more compost or aged manure into it to ensure it’s nutrient-dense. Taller varieties of phlox like Phlox paniculata will benefit from thinning early in the year. Once the plant has reached a six to eight inch height, leave at least a half-dozen of the strongest stems, and trim the others back to the base of the plant. Once you’ve finished thinning the stems, pinch off the top of each remaining stem just above a leaf bud to encourage bushier growth. Deadheading the spent phlox flowers is essential to prevent accidental reseeding of the plant. If you regularly remove your spent flowers, the plant will also be encouraged to bloom more, which keeps the color going for a longer period of time. Shorter, creeping phlox varieties like Phlox subulata and Phlox stolonifera should be trimmed back once they’ve finished flowering. Trim a third to half of their height once flowering has subsided. This encourages a denser matting pattern in the plant and more flowers in the next blooming season. If you’ve just divided your phlox it’s important to be sure you have rich soil ready to plant in. Divided plants should be examined and any damaged or unhealthy roots should be trimmed off. Make a hole in your planting location or pot and then gently spread out the roots so they have plenty of room before covering them with fresh soil. If you’re simply repotting a plant into a larger pot or bed to allow it to continue growing, carefully dig it out of its prior container or bed. Examine the roots and trim off any unhealthy ones, and then plant it as if it were a divided plant, being sure there’s plenty of room available for expansion. If you’ve done all of the stuff I mentioned above, it’s likely that your phlox is thriving. But what if it isn’t? Here’s a few things that you might not have considered. Often, people who plant a creeping phlox ground cover have high hopes of a carpet of pretty pink or purple phlox flowers. However, Phlox subulata requires full sun conditions for best performance, and so shadier environments can make for weedier, less-full growth and a distinct lack of floral display. 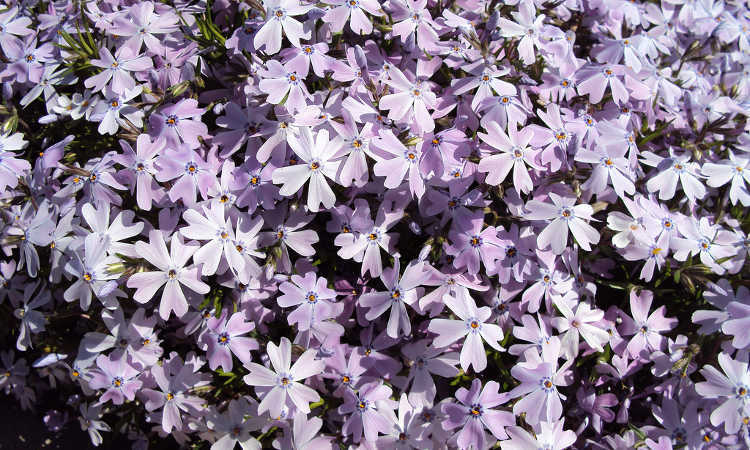 If you are trying to encourage a phlox ground cover, be sure that you have good sun coverage. If most of your location is partial shade, consider Phlox stolonifera, which does better in partial shade conditions than subulata does. 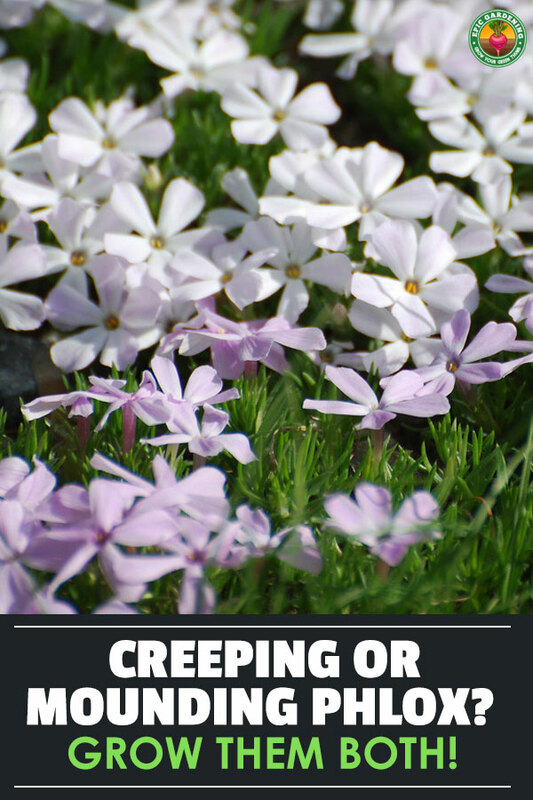 Browning in the center of a creeping phlox is usually an indicator that your plant’s roots are becoming crowded. If the center of the phlox is starting to die back, carefully dig up the plant, divide it into multiple smaller plants, and replant it to allow for more root growth. Wilting phlox is most commonly caused by improper watering techniques. If the soil is dry for too long, phlox plants have a hard time when an influx of water happens, as they can’t easily take up the soil nutrients or water to replenish themselves. Keeping the soil evenly moist will prevent this problem. Be careful not to overwater, as that can damage roots and actually cause the plant to start to drown and wilt from too much water! Spider mites are a common pest on both creeping phlox varieties and mounding tall phlox varieties. To prevent spider mites on phlox, a thorough spraying of neem oil on all plant surfaces will take them out. This also works well against aphids, which are another very common pest on phlox. The phlox plant bug, Lopidea davisi, is a highly-specialized pest. Feeding primarily on the sap of phlox, it can cause spotting and stippling on leaves, later developing into to browning and plant death. It’s advised to try to prevent the bug’s appearance by using an insecticidal soap like Safer Soap and by cleaning up plant litter or dead stems. If your bed is already infested, this red and black insect can be killed with the use of a pyrethrin spray such as Safer Brand Yard & Garden Spray. Snails and slugs may also take shelter in and around your phlox. While these cause minimal damage to the phlox itself other than a few nibbled leaves, they can cause damage to other plants in your garden. Sprinkle some Garden Safe Slug & Snail Bait around and through your phlox patch to deter these common pests. One of the most common diseases to hit phlox is powdery mildew. This is especially true in areas that have hot, humid summer conditions. You can control this by applying neem oil to all plant surfaces. Planting mildew-resistant cultivars is also an option, as there are a number of them available now. Fungal leaf spot can also be a problem. Thankfully, this too can be treated by regular applications of neem oil. If you are seeing signs of leaf spot, apply once a week until the spotting subsides, then apply monthly to prevent another outbreak. Some phlox are susceptible to rust. To prevent rust from spreading, use a fungicidal spray like Bonide Fung-Onil to wipe it out. This spray also works well on persistent cases of leaf spot. Finally, perennials like phlox are susceptible to root, crown, or stem rot issues. These generally develop because of bacteria in the soil that develops when the soil is overly wet. To prevent these, ensure your soil is moist, but well-draining, and that any plant debris is cleaned away from your plants. Plants which develop rot issues should be removed and destroyed to prevent any further spread of the bacteria. Q: Do I really have to deadhead the flowers? A: If you want to prevent self-seeding, absolutely. It’s also a good idea even if you don’t mind reseeding, because deadheading encourages more flower growth. A plant which normally would bloom until midsummer may be able to continue flowering well into the fall if it’s regularly deadheaded. Q: The top two inches of my phlox has been chewed off! Help? A: Do you live in an area where deer are common? If so, they’re quite likely the culprit. Deer find new phlox stems and flowers to be a tasty snack, and they can wreak havoc on your plants very quickly. While it may be difficult to deer-proof the garden, using some form of natural predator scent to deter deer from coming into your yard might be a good idea. Planning on some phlox for your spring and summer flower beds? Which types do you want to grow? Do you have a favorite? Tell me in the comments! Best Mosquito Killer: Which Is Best For Your Yard In 2019? I have some creeping phlox that I planted a couple of years ago and they bloomed well last year. I didn’t know that they should be cut back after they bloom and I am wondering if I should do something now to clean them up before they start to bloom. They are kind of matted and tangled looking. Should I clip them back? I’d recommend clipping back some of the weaker stems to thin it out a bit! You could definitely wait until after they bloom though.